CPAC 2011 – Citizens United Presentation | Virginia Right! Just left a Citizens United presentation and got a sneak preview of their new 800 pound gorilla followup video. It will be released on Monday, February 14, 2011, and you’re just gonna have to wait. But it is good! 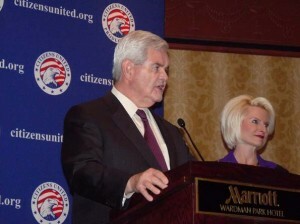 In a bit of a surprise, Speaker Newt Gingrich and his wife Callista opened the short program with a few words about the work Citizens United has done, in particular the Supreme Court victory for free speech. ← ONLY A FEW HOURS LEFT…UNTIL PARLIAMENT VOTES TO DEFY ECHR?